There’s a myriad of reasons to keep houseplants in your home. They improve air quality by filtering out toxins, they add vivacity and energy to your living space, and it’s simply rewarding to watch them grow. But as lovely as our plants may be, it’s important not to forget about the health of our other beloved housemates: our pets. You may have heard that many common houseplants are poisonous to cats and dogs, but don’t let that deter you from buying plants altogether. There are plenty of popular non-toxic house plants safe for cats and dogs to coexist alongside. Here’s a list of some of our personal favorites. Spider Plant: This ever-popular houseplant is easy to care for, and easily reproduces all on its own, with tiny little spider plant babies practically popping off the plant, ready to propagate. It’s a particularly effective air purifier, so you can rest easy knowing your air is clean and your pets are safe. 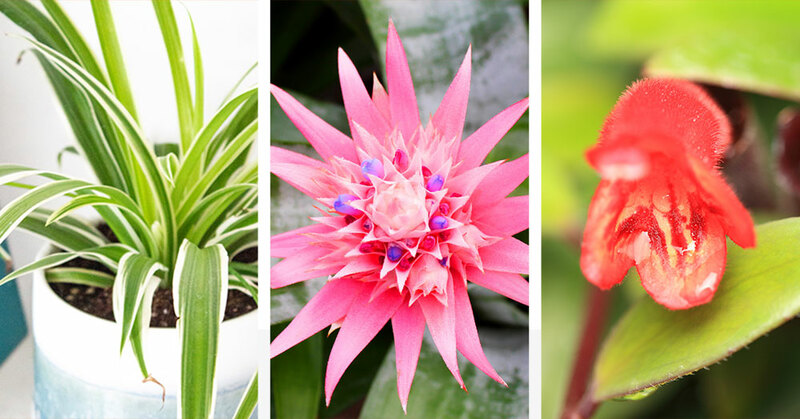 Bromeliads: The strange name may be a bit of a mouthful, but you’ve likely seen this bright beauty around before. Its bright spiky head looks like a glowing flowery torch surrounded by lustrous green foliage. No need to worry if your pets get curious and sample a piece. Lipstick Plant: This funky vine has bright red, cylindrical flowers that look like— you guessed it— lipstick. This fabulous plant makes quite a fashion statement, just like its namesake, and it’s 100% safe and non-toxic. Succulents (well, most of them): These trendy plants are popping up everywhere lately, and thankfully the majority of these trendy and stylish plants are pretty safe for pets. Popular varieties like Echeveria, Burro’s Tail, Hen and Chicks, and Haworthia are all harmless options. That being said, there are a few varieties out there that aren’t so safe, such as Jade plants. If you come across a variety that you’re unsure about, err on the side of caution and do a quick Google search before you bring them home. African Violet: This adorable fuzzy plant is pretty easy to keep happy, and it blooms all year round. The Goldilocks of plants, it likes everything moderate – a medium amount of sunlight, and uniformly moist conditions. Just try to water the soil underneath its leaves, instead of watering the plant directly to keep it looking its best. Peperomia: Also known as the Waffle plant, Friendship plant, or Aluminum plant, this tiny little guy is available in all sorts of colors and leaf shapes. 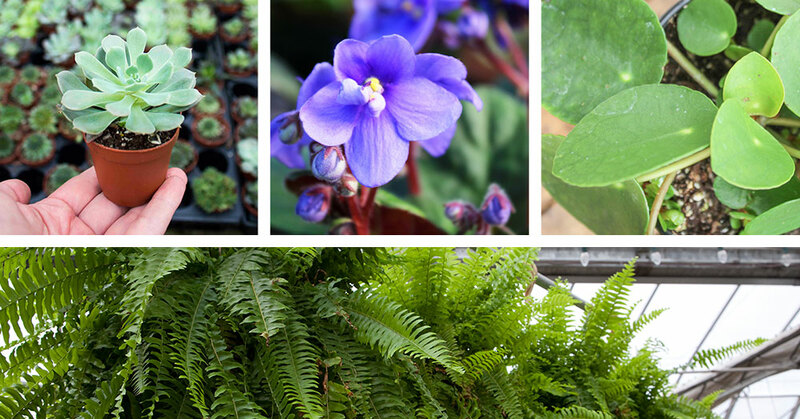 The wide variety of looks and names for this plant is a testament to its popularity and success as a houseplant! Their small stature makes them a fantastic option for a glass terrarium, and there’s no risk of harm to your pets. Ferns: A true fern should be non-toxic to cats and dogs, as is the case with Maidenhairs and Boston ferns. However, some plants are labeled as ferns when they actually aren’t, like the Asparagus fern. This plant masquerading as a fern is actually pretty toxic to animals, so just to be on the safe side, if you’re interested in a plant labeled as a fern, but you’re unsure if it’s legitimate, just nudge one of our store associates and we can help you out. It’s always a good idea to do a bit of research before going ahead with a plant purchase when you’ve got pets at home. Luckily, a simple Google search should easily confirm whether or not it’s safe. In the event that your pet shows signs of illness and you come across a chewed-up plant in the house, don’t hesitate to bring your pet to the veterinarian. Bring along a section of the plant’s leaf, and take note of any symptoms you see. While there are some plants out there that may pose a risk to your animals, there’s just as many out there that present no risk at all and still remain to be popular additions to many homes. If you’re ever in doubt, just visit us at the shop and ask for help. We’ll be more than happy to help you find the perfect plant to brighten up your home, without giving your beloved animal companions an upset stomach.